CC Sabathia confronted his demons when he entered rehab last fall, and he recently opened up about his battle with addiction in a powerful essay for The Players' Tribune. It’s not easy to confront your demons. Sometimes it can be even harder to talk openly about them. But New York Yankees pitcher CC Sabathia was able to do both recently in an emotional essay for The Players’ Tribune. Sabathia’s essay went into detail about his battle with alcoholism. The pitcher first drew attention to his personal struggles when he decided to enter rehab at the end of baseball’s regular season last fall. 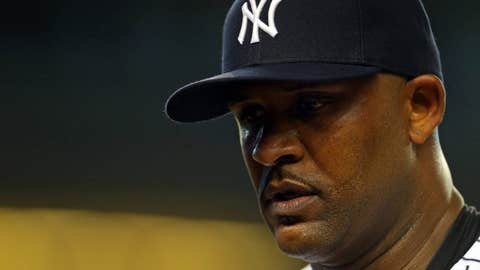 Sabathia was forced to miss the Yankees’ Wild Card game against the Houston Astros as a result of the decision, but as he shared in The Players’ Tribune, that decision was key both in helping his team succeed and, more importantly, in helping himself be at his best. The 35-year-old was candid when discussing how alcohol had become so present in his life and admitted he had never really wanted help until last fall. Now, Sabathia said he wants to be transparent about addiction. He made an unusual move in directly asking the public to hold him accountable, and he noted he wants to be called out if he appearts to be slipping in his recovery. The left-hander enters the 2016 season with a clean slate, but he will have plenty of work ahead to prove he is worth his $25 million contract. Sabathia went 6-10 with a 4.73 ERA through 29 starts in the 2015 season, and the Yankees will want much more than that out of the pricey pitcher. Sabathia’s contract is only guaranteed through the end of this season, but there is a $25 million vesting option in his contract for the 2017 season. That option comes with a clause that would allow the Yankees to buy out the contract for $5 million if Sabathia does not meet certain health-based benchmarks. This coming season will be a pivotal time for the pitcher both in terms of baseball and in terms of his personal life. But Sabathia’s essay shows that his most important achievement will not be his ERA or his record or even his ability to win a World Series ring. The biggest achievement for Sabathia will be his continued sobriety, and his essay shows he is on the right path toward realizing that goal. I was in Baltimore at the time. It was the last Sunday of the regular season and we were about to start the playoffs. We’d gotten rained out on Friday, and I’d spent most of the weekend alone in my hotel room clearing out the minibar. We had a game that day, but I knew that I wouldn’t be able to help my teammates if they needed me. I was struggling to function physically, but I also felt awful in so many other ways. It struck me how tired I was of feeling sick. And how exhausted I was after keeping this secret for so long. Of course, I understand that I can relapse. And that’s why I’ve tried to be as open and public about this situation as I can. I want to be held accountable. If someone sees me with a drink, or in a bad situation, I want them to say something — because I really don’t want to drink anymore. I don’t want any part of it.